Nikki as she appears in Nikki's Travel Quiz. Nikki (ニッキー, Nikki) is the female host and mascot of Nintendo's messaging applications, Swapnote and Swapdoodle. Originally created to give tips and rewards, she has since appeared in other Nintendo media, such as Art Academy: Lessons for Everyone!, the Japanese Nintendo News Section, a costume in Super Mario Maker, and her stand-alone game Nikki's Travel Quiz. Nikki introducing the player to Swapdoodle. In Swapnote, Nikki (as a Mii) would introduced the player to the application, give tips, and encourage the player. She was also able to update the player of Nintendo news. She later appeared in Art Academy: Lessons for Everyone! where she would give an art lesson on drawing a Goomba. Nikki preformed the same roles as the two previous apperances in Swapdoodle. She now mainly appears (no longer as a Mii) in the Nintendo News section. 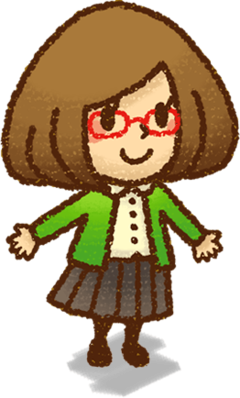 Nikki's design is based off of her 2D look from Nikki's Travel Quiz and the Nintendo News Section, which, in turn, is a redesign of her Mii appearance from Swapnote. She is located on the bottom left of the screen while drawing, similar to how she does when drawing in her home series. Nikki appears as an Assist Trophy. When summoned, she draws a picture using her pencil, which attacks players. Nikki will draw 3 pictures total, with a seemingly random order chosen, and each drawing being different. Afterwards, she waves before disappearing. Nikki's original appearance as a Mii on Swapnote. Nikki as an Assist Trophy in Ultimate. Nikki drawing a dragon on Spirit Train. Despite debuting as a Mii, Nikki is the first Assist Trophy to not originate from a video game, instead appearing from a messaging application. Nikki is referred to as the host of Swapnote despite the application being unavailable and being replaced by Swapdoodle. Nikki is the only Assist Trophy that cannot be used in Ultimate's Final Destination. This page was last edited on April 12, 2019, at 02:08.